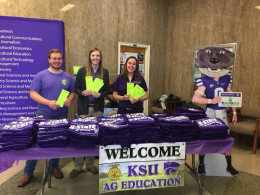 The Agricultural Education Club and the Agricultural Communicators of Tomorrow (ACT) club each hosted a booth at the university-wide K-State Open House on Saturday, April 7. These booths were among many in the College of Agriculture (COA) “hub,” where several other agricultural student organizations hosted booths. 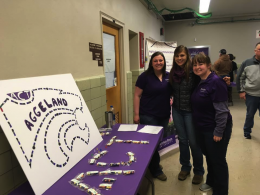 The weather wasn’t ideal, so the agricultural organizations’ booths were housed inside Waters Hall. However, it didn’t stop alumni, kids, or students from visiting campus for this fun weekend event. 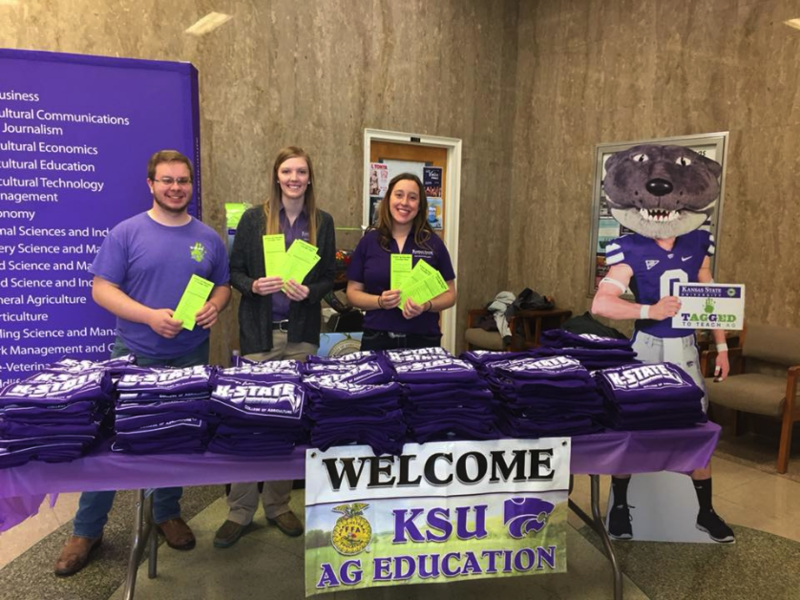 The AgEd Club coordinated the COA Scavenger Hunt with the help of Matthew Schick, a junior in agricultural education, who spearheaded the event for the club. He gathered donations from 13 different organizations to sponsor over 300 printed t-shirts. Individuals who visited the booth and completed the scavenger hunt earned a free t-shirt, while student volunteers passed out scavenger hunt cards and t-shirts. The ACT booth’s theme was “Aggieland,” to reflect an agricultural version of Candyland. Visitors were able to test their knowledge of the K-State brand and history. Participants moved around the Aggieland game board after answering trivia questions. Visitors received chocolate covered soybeans, donated by Kansas Soybean, after completing the game.